By the Apostolic constitution ‘Ex Primaevae Ecclesiae’ of November 13, 1952, when the Archdiocese of Madras and the Diocese of Mylapore were amalgamated and made into the Archdiocese of Madras – Mylapore, the southern portion of the Diocese of Mylapore was erected as the Diocese of Tanjavur, while North Arcot District (excluding its two taluks of chengam and Thiruvannamalai which were still under the Archdiocese of Pondicherry), a part of the District of Chittoor i.e the two taluks of Palmaner and Chittoor and the Taluk of Tiruthanni (at present in the District of Chinglepet) were detached from the old Archdiocese of Madras and were created as the ‘Diocese of Vellore’. The new diocese of Vellore was entrusted to the Salesians of Don Bosco. According to the same constitution, the Most Rev. 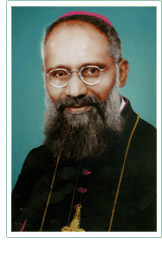 Paul Mariaselvam SDB, of sacred memory, was appointed the first Bishop of the Diocese of Vellore. He was consecrated on 19th of March 1953. In the newly erected diocese, many were the difficulties that confronted him. He did not even have a residence. He had to be in a rented house. Practically all the catechists of the diocese had to be paid; new chapels and presbyteries had to be built. The finance was at very low ebb. However, Mary Help of Christians was his guiding Star. With Zeal, he set to work. He visited most of the mission stations. His first and foremost attention was to bring a renewal in the teaching of Christian doctrine to the school children and to get good and efficient catechists for evangelization. One could say that he was burnt up by the zeal for souls. His premature death on June 25, 1954, was a severe blow to the ‘Infant Diocese’ and its flock. Within the short span of 15 months as Bishop of Vellore, he endeared himself to all. His mortal remains were placed at the sanctuary of the Assumption Cathedral, Vellore on 26th June 1954.